Among my favorites are the recipes of Texas Mexican family-owned restaurants like Matt’s El Rancho, Mi Tierra, El Chico, El Tiempo, Sylvia’s Enchilada Kitchen, Los Barrios, and so many more (I realize that every time a make a list, I have regrets because absolutely in this case I’ve left out important and delicious ones–disculpas). There is no end to the creativity that can go into a Chile Con Queso. 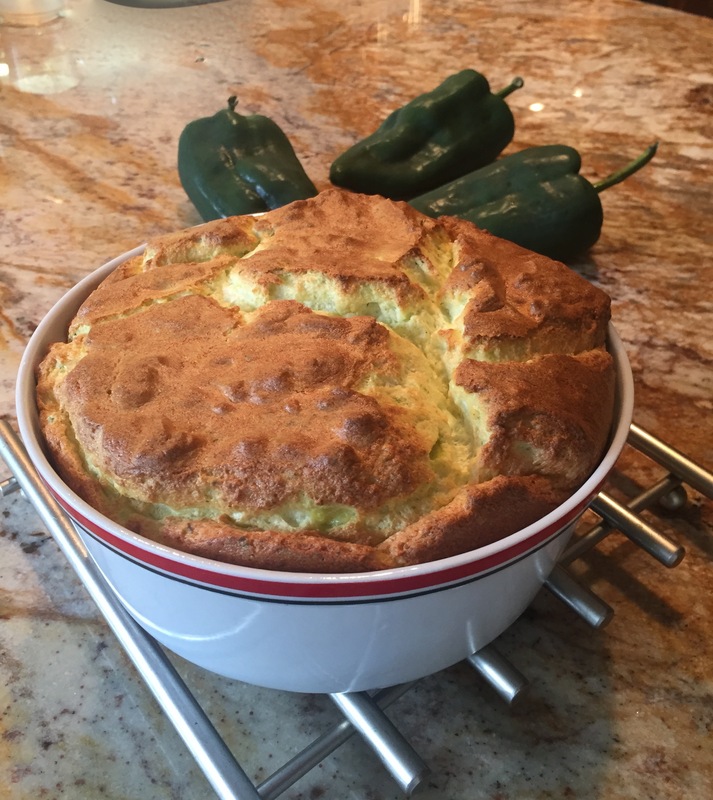 Following the call of creativity, I used my “Chile Con Queso” recipe to make a soufflé, re-purposing the ingredients and flavors. It’s a recipe for the experienced cook, and I offer it as an example of how strongly Mexican ingredients and culinary aesthetics influence fine dining all over the world. Chef Iliana De La Vega says in a recent interview that “fine dining is not about white tablecloths and fancy china, it’s about taste.” And Mexican taste and ingredients are influential and delicious. Of course it’s French, but it’s also Mexican, the two cuisines having been combined ever since French people stepped onto our soil. The Poblano flavor is mixed with the delicate crema Mexicana and the robust Chihuahua cheese. If you love to cook, you’ll love this recipe. The bottom of the soufflé dish is layered with a thin tomato and onion “fondo” (“fond” in French). To my taste, this makes it a respectful variation on the traditional Mexican Chile Con Queso dish. 1. To make the “fondo”: Heat the Canola oil in non-stick skillet over low-medium heat, then add the tomato and the onion. Cook slowly until the juices from the tomato evaporate and the onion is translucent. 2. Grease a 9″ soufflé dish with butter and sprinkle the bottom with the cooked onion and tomato. This layer will caramelize and form a flavorful “fond” at the base of the soufflé. Set aside until ready to be filled. 3. Place the green chile poblano under a broiler and char the skin on all sides, turning the chile as needed. After all surfaces of the Poblano chile are charred, place it in a paper bag so it cools down and sweats. This’ll take about 15 minutes but you can leave it in the bag for several hours if you have to. 4. Place the cooled Poblano chile on a cutting board and, with your fingers, peel off all of the skin. The skin will peel off easily because sweating in the bag releases the skin. Make a slit along one side, lengthwise, and remove all of the seeds and the stem. 5. Place the peeled, de-seeded chile in a blender and add 1/2 cup milk and salt. Blend until completely smooth. Set aside. 6. In a saucepan, heat the butter and flour over medium heat, stirring to combine, for about 2 minutes. The mixture will turn a golden color (not brown). Remove the saucepan from the heat. 8. In a bowl, add the egg whites, pinch of cream of tartar, and beat until you have firm peaks. 9. With a spatula, add about 3/4 cup of the stiff egg whites to the Poblano/cheese mixture and incorporate it, folding gently to make the whole thing lighter. Then add the Poblano/cheese mixture to the egg whites and fold together thoroughly, gently. A good way is to slice the center with the spatula and scrape the bottom outward, folding the sides over the center and repeating. 10. Pour the mixture into the buttered soufflé dish and bake for 22-25, until the soufflé has risen and the top is a deep golden brown. Please send me your comments and which wine or Mezcal you served with it.